You are here: Home / How To Play Guitar / JamPlay Review, Are These Guitar Lessons Good For Beginners And Intermediates? JamPlay Review, Are These Guitar Lessons Good For Beginners And Intermediates? Hi guys. My name is Shaun Letang from Musicindustryhowto.com. Today I have another review for you of one of the online guitar lessons. Today we’re going to be looking at JamPlay.com. 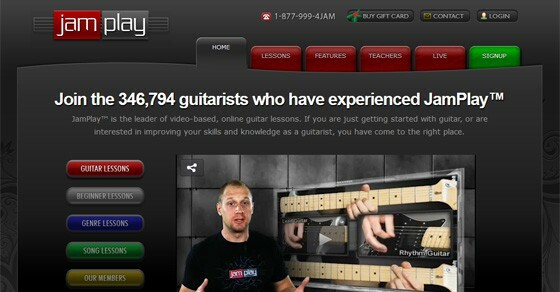 For those that don’t know, Jam Play is one of the biggest providers of online guitar lessons. Of course, it’s easy for us to say that, but you’re going to want to actually look inside and see what they have to offer. This is what I’m going to offer you today. First of all, this is me looking into JamPlay.com. As you can see the home screen, there’s a lot for you to do, a lot for you to look at. I’m going to point out a few important things so you kind of know what you should expect. First of all, you’ll notice this is very community based. They don’t just fling up online guitar lessons and just expect you to play along. Of course, that’s a big part of it, but there’s a lot more to it than that. For example, over here you can see there’s a lot of forum activity that’s going on. You can actually communicate with other people who are also part of the course, the lessons. As you can see, if you scroll down a bit, they have a lot of live sessions where you can log on with your webcam and you can talk to the guitar teacher live in person. As you can see, there’s a lesson going on right now. I won’t actually log into that part. When you actually sign up you can do that and you can talk to the people and get involved. It’s not just one every day, as you can see there’s quite a few. There’s a few more coming up today in the next few hours. You can go to the full schedule and see a lot more lessons going on. As well as that, they also have standard guitar lessons which you can learn from. This is one that I’ve actually started already. I just had a quick play around. As you can see now, I’ve started my lesson. I can actually start playing. Basically, that’s what you’ll be learning. All the different lessons, they structure them in different ways. That’s the one they done there. From there you can kind of gets the bits to supplement the lesson. You can learn the strings and get the images. What I like about JamPlay which a lot of other guitar lessons don’t do, they actually allow you to take notes. If you want to write your notes, you can do that. You can save them so next time you come here, you can remember where you’re at. That’s a big feature because a lot of other guitar lessons, like I said, don’t do that. Another thing you’ll notice is there are actually comments. You can actually start posting. A lot of people, they’ve already used these lessons. If you were not sure about something, you might want to check this out as they might have stuff to help you out, issues might already be addressed. One of the things I like about lessons is they actually keep track of everything for you. It’s not like you have to remember what part of the lesson you’re at. You can actually look through each video and you can see how far you’ve gotten in each of them. For example, these ones as you can see I haven’t even started on. Over here, this one’s almost complete and you can pick up there for the next time. If you want to go back to the home, you can do that here. Another thing you’ll want to do is actually look at the lessons you want to learn. Say for example you want a Beatles song. You can check it out here or you can basically look around this. There’s a lot of different lessons. I’ll show you some now. Let’s go into phase 1. Let’s say you’re a beginner, a beginner guitarist. Here we’ve got our choice of different teachers. We’ve got acoustic teachers, we’ve got electric teachers. Let’s say for example we pick Eve Goldberg. I haven’t looked at her yet. Here we go. Some of the lessons she provides are introduction to guitar, learning chords, and the like. Let’s choose the E chord. You can basically learn from this teacher or you can pick another one. It’s pretty much up to you. I’ll have a quick look at this. This is pretty much an introduction video, let’s look at the next one. Basically, she’ll walk you through each chord, whatever it is she’s going to teach you how to learn, and she will let you know how to do it. Once again, they’ve got the supplemental lessons. They’ve got the place where you can leave your notes. This is comments from other students. If you’re not sure of anything you can always just ask a teacher. You can pick them, you can message them, or you can talk to a teacher. Okay. That’s pretty much it. This is pretty much the basics of what you’ve covered. There’s a lot of other stuff you can do. There’s blocks of songs for you to play along to. Lots of different tutors. Lots of things to learn and art, cool giveaways, entertainment, there about the blog which has a lot of useful articles. Yeah, that’s pretty much it for Jam Play. If you want to learn to play guitar, if you’re a beginner or even an intermediate or even if you’re an experienced guitarist, but you just want some extra songs to play to and want some extra tips, then Jam Play is a very good option. To me in a lot of ways they’re probably one of the best online guitar lessons around. Price wise, Jam Play comes standard at more or less 20 dollars a month. If you use the coupon codes I’m going to link to at the bottom of this video then you can get a discount from them. In comparison to other online guitar lessons, it’s a bit more expensive than the other ones to be honest, but recently they just introduced a free trial. If you’re not sure if you want to use Jam Play yet, you can take a trial and you can see if it’s for you. All right. That’s pretty much it for my JamPlay review. Hope you find it useful. If so, subscribe to the channel. promusicianacademy (on Youtube) and expect a lot more videos coming from me very, very soon. By the way, how does this compare to other online guitar lessons? Well you can see how it measures up against Guitar Tricks and Jamorama here.